Kitchen Corners: Public School Lunch: Should you smile or cry? Public School Lunch: Should you smile or cry? Last week I received a big box in the mail from McCain Foods Limited. They are the leading brand in frozen foods and one, if not the biggest, supplier of foods to public schools around the country. They are excited about new products that your child will soon eat, or at least see, in public school cafeterias. One of the products is the smiley fries shown above. I enjoy my blog very much and I appreciate getting free food in the mail to review. However, in case you are wondering, I do not make any money from my blog and truthfully you could not pay me enough to say nice things about your product if I don't like it. Everything I say here I actually mean. So, thank you McCain Foods Limited for sending me this but I believe that school lunches should be healthier, much healthier. I made the smiley fries tonight. I was given instructions to either deep fry or bake and I decided to bake and this is what they looked like. And Enzo loved it! My son has not been the easiest eater. I was stoked he liked these and I don't mind feeding him smiley fries once in a while. They tasted good, they were surprisingly crunchy, and of course they were drowning in grease. Would I want Enzo to eat these or similar foods every day? Definitely not. My children will go to public school one day and I am seriously concerned with what they will be offered at their cafeteria. Will I have to pack them a lunch? Probably. However, to even acknowledge that I will probably pack them a lunch is a privilege that most parents don't have. When I was in public school in Chicago my parents did not have the means and much less the time to pack my sisters and I a lunch. In fact we ate all 3 meals at school and it was gross and very unhealthy. It also didn't look anything like these smiley fries. Enzo liked eating these because of the taste but also because of the way they look. I know that even if I packed Enzo a lunch from home he would get to school and try to get his hands on these. Can you blame him? They look fun. So now I have to worry about making him a healthy lunch that looks cool. Smiley face beans? I don't think so. What are your thoughts and concerns about public school meals? School lunch was all I wanted up until high school. Then I realized soggy cheese pizza and overcooked canned green beans were gross, so I made my own lunch. In elementary school, I had a cool lunchbox, so I was mostly ok eating homemade lunch, but I begged for school lunch. I also thought the kids who got to eat breakfast at school were so lucky! I think school lunch can be a compromise- a couple days a week, but certainly not every day. That's expensive, and unhealthy. But an ok indulgence. Semestre passado eu fiz um trabalho de nutrição em uma escola pública aqui de Orem. Eu sugeri que algumas coisas do menu fossem mudadas, mas no geral a dieta parecia bem balanceada. Eu não cresci aqui então não sei muito bem como funciona nas escolas. Eu concordo que smiley fries não são a coisa mais saudável do mundo, mas tenho certeza que se eu desse algumas para o Chris (que não como nada!) ele iria amar. I have learned A LOT about USDA food programs in the past month because the day care where my son is at is part of the USDA food program that is served in different school settings. Because we eat vegetarian, the administration did not really know what to do about us as a family, so we had to do alot of research so that the day care could honor our diets. I am happy to report that we will be brining in our own food (but that is a lot of work, and like you said Da, a privelidge) and the daycare has been good about working together with us to dind a good middleground. The USDA food programs may have good intentions, but some of the specifics are scary. For example, tofu or a veggie burger would not be considered an alternate protein product, but casein in pizza crust would count as an alternate protein product. There is no clear cut "asnwer" to nutrition, but I think we as consumers should pay close attention to good reliable scientific research to stay informed about the status of current nutrition standards and not depend so much on the government to tell us or show us how to eat. I agree with Elizabeth, an every once in a while indulgence doesnt really hurt. I had to eat school lunch too. It was called Free Lunch because I qualifyed for it. To make it worse, in middle school, My friend always wanted my "School lunch" so I gave her my lunch and she would give me here lunch money and I would go buy the donuts and pizza sticks at the snack bar for my lunch! I still managed to stay really thin but my goodness, I ate a lot of crap during school so I understand your concern. I hope my children will make better choices or at least I hope I can be a stay at home mom by that point and make my kids really yummy, healthy and fun lunches! I pack my kids lunches. I worry about the health factor with school lunches also. I look at the menu when it comes home and let my kids choose MAYBE one lunch a week that they can eat at school. But truthfully, I agree that school lunch is more of an indulgence than an every day thing...it's kind of like going out to fast food. Fun once in a while, but not something you want to give your body daily. My son got a pretty decent school lunch here in NYC, he didn't complain much about the food and they didn't serve anything fried or any pork products and he did occasionally bring a packed lunch. This year is going to be much different with him starting middle school I have no idea what I'm in for. Well in our school district almost everything served is ready to heat and full of trans fats and other nutritionally bankrupted ingredients. Artificial colors, preservatives, etc. They do serve some fresh fruit and veggies but not consistently. I have always packed my kids lunches. Every day. We eat organic and tend to follow Nourshing Traditions/Weston A. Price Foundation Philosophies. We aren't militant about it, but school lunch programs under the USDA tend to be quite nutritionally unhealthy. I have laptop lunchboxes and pack them for my kids everyday. It makes it fun and appetizing for them to see their food and help decide what goes in each bento style container. I try to buy local too, as it is fresher, better for our local economy and better for the environment (less petroleum dependent). 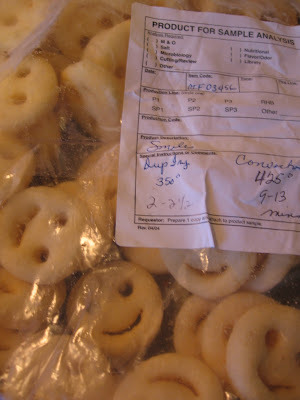 I do wonder what the ingredients are on those smiley fries!! I went online and looked up the ingredients. These aren't real food. They are dehydrated potato flakes (highly processed, non-nutritive) with preservatives and unhealthy oil (canola or other oils--look up the refining process for rapeseed oil (canola), it is horrible for you). Then modified Potato Starch which is highly processed and creates free radicals which are akin to MSG. Potatoes, vegetable oil (contains one or more of the following oils: canola, soybean, cottonseed, sunflower, corn), Dehyrated Potato Flakes (Potatoes, Mono-& Diglycerides, Sodium Acid Pyrophosphate & Citric Acid added to maintain natural color), Potato Starch-Modified, Salt, Dextrose, Sodium Acid Pyrophosphate added to maintain natural color. I make oven fries for my kids with organic, local potatoes. I buy blue, red and white or yellow colored varieties and just toss them with a bit of Olive Oil and sea salt and black pepper sometimes a bit of crushed garlic. Taste is fantastic, not as crispy as fried, but still good. Oh Yuck! I was wondering what the ingredients were but was scared to find out. I was surprised how they tasted fried even though they were just baked. Yikes. Thank you everyone for leaving a comment. I appreciate it and enjoy reading your insight. My high school cafeteria definitely didn't have too many healthy options. The healthy choice was sub sandwiches. I usually had fries and burgers when I ordered lunch there. 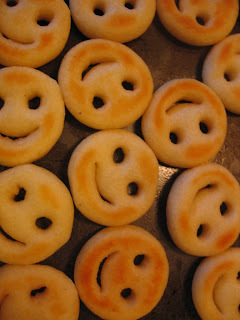 These smiley fries are cute and I could see how they would appeal to kids. Reading the ingredients though? EW! USDA is really odd... I'm going through the process of becoming a licensed child development home provider and after looking through the USDA information, I'm considering not participating (even though they reimburse the provider for meals and snacks served). Did you know that the cake part of birthday cake counts as a bread? Same as whole wheat pitas. And that ice cream can be considered the same as milk? I think not. OK, this is going to sound extremely negative, but it is at least mostly true. The USDA doesn't work for us - their goal is NOT to make us healthy. They work for big food industry folk: the Cattleman's Association, the National Dairy Council, etc. No kids but do worry about what they would eat when they have school lunches. When I was at school (left 6 years ago) there was one queue for 'healthy options' (i.e. not chips) and then two others which specialised in pizza and chips and burger and chips. You could get through the pizza queue in 1/10th of the time of the healthy food queue. Imagine eating that 5 days a week - although at the time it was the greatest treat ever, those huge pizzas and crispy fries! I think packing them a lunch most days but leaving them to have school dinner once a week will satisfy the cravings for unhealthy fried food like the above smilies. You could compensate for this in the lunch by going for something a bit healthier than usual, 0% fat yoghurt for example and then they'd never realise that all their meals during the week are making up for their bad dinner on a friday! The above is something I do to myself now, now that I understand a bit more about healthy eating. Homemade sandwiches 4 days a week and the opportunity to push the boat out once a week if I want to. I just finished high school and I was lucky enough to go to a school that actually had pretty delicious and healthy lunches. The salad bar was only around once every couple of weeks, it was always fresh and a variety of veggies were provided. In addition to that, we had premade salads, wraps and sandwiches available every day. I guess we also had the usual unhealthy food as well, but there was always the option of the healthier foods. 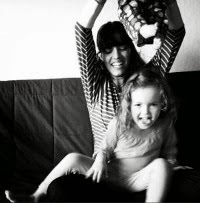 I'll also probably pack my kids' lunches when the time comes...for tips on making lunches "cool" even when they come from home, you might check out http://veganlunchbox.blogspot.com/ and check through all her archives. Even if you are not vegan, I think a lot of her ideas are really adorable and help make lunches really special! Don't even get me started on school lunches! I have a teaching credential, so I spent a lot of time in elementary school cafeterias....and the promotion of the 3 servings of dairy a day makes me irate. We don't NEED dairy, it's for baby cows. Plus, all the preservatives, food colorings, additives, hormones, and antibiodics put in processed foods...very gross. A comida da escola pública é muito pobre em comida saudável! Eu tenho a mesma preocupação que vc! E eles comem mais na escola do que em casa! As crianças fazem 2 refeições na escola e em casa sobra então a janta! Eu já vi o café da manhã deles. E era a coisa mais gordurosa possível! Isso poderia mudar, porque é difícel de encinar eles a comerem coisas saudáveis em casa e na escola parece ser normal! Realmente não dá pra entender porque eles escolhem esse tipo de comida pras crianças comerem! I agree with Chelsea. Thinking of all those frozen bags of genetically modified, preservative loaded, artificially enhanced, highly processed (from every angle) "foods". Vomit. And the audacity to make them into smiley faces! I remember the two "milk breaks" in school, and how crate after crate of hormone-pumped milk (with artificial flavoring and corn syrup solids of course) would be distributed to everyone whose parents ordered it (fifty cents a day, I think?). I always had a thermos of soup (canned soup, probably not a whole lot better than anything else) but clearly better than the kids meals on KFC day! I got an e-mail from a representative at McCain and this is what she said "Smiles is a reduced sodium, zero grams trans fat product. An average serving (½ cup) contains only 5 grams of total fat (less than 30% of calories from fat), 1 gram of saturated fat (less than 10% of calories from saturated fat) 0 grams trans fat and just 180 milligrams of sodium. They are also an excellent source of potassium and contain 2 grams of fiber per serving"